Are you a freelance/self-employed journalist, writer, photographer, artist, or producer without health insurance? 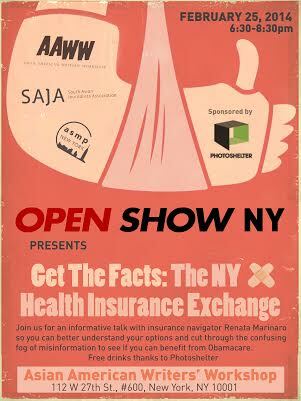 Do you have questions about how the NY Health Insurance Exchange works and how to sign up before the March 31st deadline? Come to a free informational session hosted by Open Show, SAJA, the Asian American Writers' Workshop and the American Society of Media Photographers for answers. Insurance navigator Renata Marinaro (Director of Health Services, Eastern Region, the Actors Fund) will discuss how the health insurance exchange works, what your options are, and what you need to do to register in time.